IMSO Director General, Captain Moin Ahmed (left) with Iridium Director of Maritime Safety and Security Services, Kyle Hurst at the Public Services Agreement signing ceremony at IMSO headquarters. 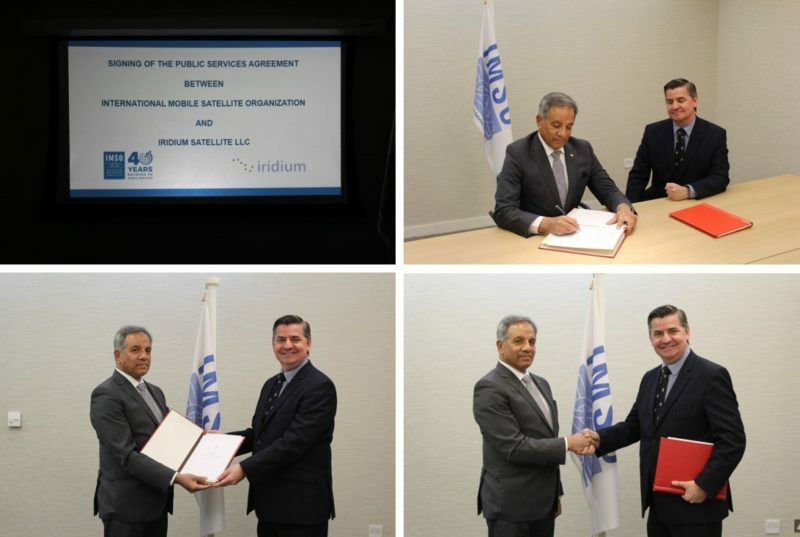 Iridium Communications signed a Public Services Agreement (PSA) with the International Mobile Satellite Organization (IMSO), which details the conditions for IMSO to act as regulator and maintain oversight of Iridium’s Global Maritime Distress and Safety System (GMDSS) services. The signing of this agreement is a key step towards IMSO issuing Iridium a Letter of Compliance, stating that the company is ready to begin providing its GMDSS service. The GMDSS is a safety-of-life system created by the International Maritime Organization (IMO) designed to rescue mariners in distress while at sea. It is comprised of satellite communications systems feeding distress information into a network of rescue coordination centers around the world that orchestrate related search and rescue efforts. In May of 2018, the IMO adopted a “Statement of Recognition,” stating that the Iridium network met the requirements needed to provide GMDSS service. The post Iridium Signs Agreement With IMSO for GMDSS Service Regulation appeared first on Via Satellite.